Monitoring and log files can be useful when problems arise, especially in larger networks or when many services are active. Zentyal offers two options: the activated monitoring module provides you with near real-time graphical representations using the "hard" data from your computer system, while the log services module monitors each individual active server module. Log services and monitoring are available as separate modules via the component selection. After one reboot, users will find a Maintenance module in a core list on the left. The options Monitoring and Logs are under that. You can open available log files for different services in the right-hand pane. Click on the Service button, which is marked with a gear, in the column marked Full Report . Zentyal now branches out in a window with various parameters. The full view of each log file can be accessed by clicking on Display . To filter the services to display, users can specify different criteria in the area labeled Custom Query . This seems especially useful for very large log files that can be confusing in the overall view. After adjusting the display settings, click on the Search button, whereupon the software of a modified report is displayed. The group labeled Monitoring shows a graphical representation of information about the hardware within your system. It updates almost in real time and shows the usage of key system components. Users can filter the graphic display by selecting one of the buttons at the top of the window. The section Hard Disk Monitoring , under Maintenance , shows users the availability of space on their mass storage in a pie chart. If users have multiple partitions, they can change the view by activating the desired partition in the device specifications area. Keeping a server system up to date is an obligatory task that admins have to carry out from time to time. Zentyal also provides an easy-to-use procedure for this process. At server startup, the system determines the available updates and lists them in the overview of the input screen. Because server systems are rarely restarted, however, users will find Software Management for daily use on the left in the program window under Core . This includes the entry System Updates among other things. One click opens a list of all waiting updates, where security updates show a small red shield. To install an update, checkmark the box in the Update column . This step allows you to update the system or just specific components. Finally, you can start the process by clicking Refresh (Figure 6). Figure 6: The system lists all waiting updates that the user selects. The Zentyal server configuration makes problems during the server installation and during the use of different services a thing of the past. The system is highly stable, easy to use, and offer a wide range of services. The Zentyal server also scores well in heterogeneous environments. 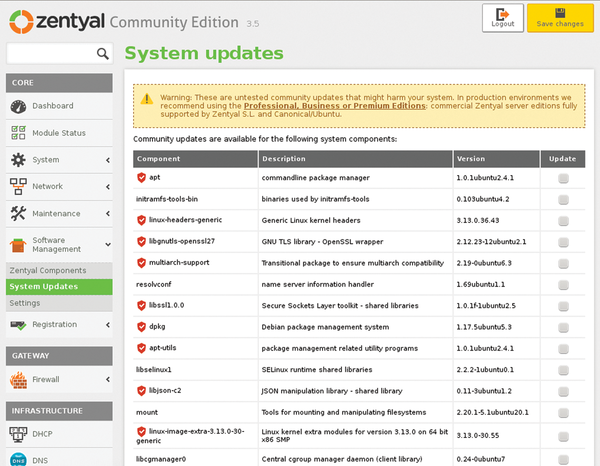 For less experienced admins, Zentyal also allows quick and easy installation and configuration of modules. Zentyal bills itself as "a drop-in replacement for Microsoft Small Business Server and Microsoft Exchange Server that you can set up in less than 30 minutes." Six all-in-one Linux server distributions and a NAS system for small businesses and workgroups feature comprehensive feature sets, simple administration, and services. Are these distributions worthwhile? The intelligent, modular SpamAssassin email filter provides a variety of advanced tests for detecting unwanted junk email.